Sign up to Dry July Australia 2018 and raise funds for Cancer Council Victoria. Every minute, every hour, every day, we’re working with the community to prevent cancer, create hope and save lives. Cancer Council Victoria works across all types of cancer and across all areas from research to prevention to support; from the point of diagnosis through to their treatment and beyond, making sure no-one has to face cancer alone. We achieve this through funding vital world-class cancer research, providing support for everyone affected by cancer, and running prevention programs to help everyone actively reduce their cancer risk. Why fundraise for Cancer Council? This is the third year Cancer Council Victoria is a beneficiary for Dry July and by taking part, you’ll be supporting the more than 260,000 Victorians living with cancer and their loved ones. By supporting us through Dry July 2018, you’ll be making a real difference through helping to fund vital support services for Victorians when they need it most. We're proud to announce that Cancer Council Victoria has received a grant from the Dry July Foundation 2018 Grant Program. Cancer Council 13 11 20 complements health services and aims to alleviate unmet needs by helping people throughout the cancer trajectory. This can be from diagnosis to living with cancer and end of life care. Over the phone or via email, Cancer Council nurses act as navigators, educators and therapeutic communicators to enable callers to better understand their situation and the support options available to them. Research of the service has shown enhanced confidence and competence for the caller to manage their own health and get the most from the healthcare team. Most importantly, experienced and understanding nurses manning the phone lines are available for anyone who has any question about cancer at any time of the day. It can sometimes be difficult for people to address their supportive care needs in the hospital setting when time-limited consultations often focus on medical treatment. Although Cancer Council nurses do not provide individual medical advice, they can talk about the effects of specific types of cancer and explain what will happen during processes like chemotherapy, radiotherapy or other cancer treatments. 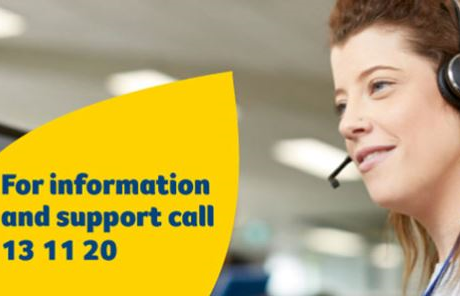 In addition to funding for the helpline, Cancer Council Victoria also received funding to translate information and support resources into Plain English and seven other languages (Arabic, Chinese, Greek, Hindi, Italian, Tagalog and Vietnamese). These will include the most-used information resources: What is cancer? ; Coping with cancer fatigue; Caring for someone with cancer; and How we help to support. 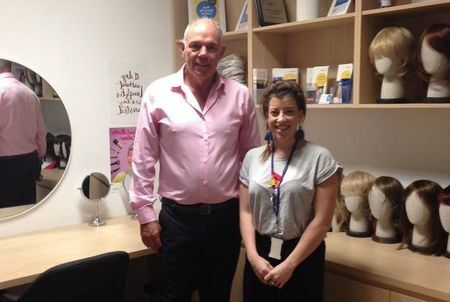 Steve Bardwell of Dry July visited Cancer Council’s Melbourne offices in April. Cancer Council outlined their plans for the 2018 Dry July campaign and an update on the projects recently funded and made possible by our generous Dry July participants. This is Cancer Council’s wig library funded by Dry July. Both service users and service providers report that this service is meeting a need that was previously seen as a gap in service provision for many people ;especially those living in rural, regional or smaller communities where service access is limited or nil. This also allows those experiencing financial hardship to access a service a no cost that they otherwise would not have capacity to pay for. “Thank you to my psychologist who provided a lot of support and gave me some excellent tools to use in rebuilding my ‘new normal’. “The service has been a god -send for me as I try to get myself and my life back to what I want it to be. To have this service available is simply fantastic and to know I can organise further counselling as the journey continues is so helpful. I have felt supported and encouraged by talking with the psychologist and Cancer Council Nurse initially when I first made contact with Cancer Council Victoria. We are blessed to have an organisation that has so much to offer to all people affected by cancer. Whilst it’s a journey I hadn’t planned on, knowing that there’s so much available has certainly been helpful for me. I am extremely appreciative of all I have received” 55yo patient, female. The funds raised from Dry July in 2017 will go towards funding projects to provide information and support to Victorians affected by cancer, as well as their family and friends. A person’s finances can be impacted from a cancer diagnosis due to costs of treatment, and changes in capacity to work for both the patient and family members. We will develop education packages and resources to help people develop financial resilience. Funding from Dry July 2018 will help us complete the second half of this vital cancer support service. People living in regional Victoria face the additional challenge to access treatment and information. These funds will be used to partner with three health services to create accessible information centres in regional health services. We provide a welcoming space for people to visit our offices on 615 St Kilda Road Melbourne. To create greater access to credible information about cancer and support services available, these funds will be used to set up information displays in our reception area. It is natural to feel a range of emotions after a cancer diagnosis that can affect a person’s self-esteem and relationships with others. Funds raised through Dry July 2017 will help us continue to offer a counselling service by experienced medical practitioners who specialise in the impact of a cancer diagnosis. Find out more about the programs and services Cancer Information and Support Service provide.